Challenges of this project: There were very low floor to floor heights in this space. There were also structural concerns regarding the removal of large sections of floor slabs, columns and girders. Overcoming these challenges: We worked closely with our Mechanical Engineers to design ductwork that could be hidden within a ceiling element or we provided flat and wide ducts, to circumvent lowering the lighting. We came up with these solutions to avoid sacrificing the design, airflow and the conditioning of the shop. The Landlord was creating the openings in the slab for the LED screen, escalators, elevator and floor layout, based on our drawings. Due to the large areas of floors, columns and girders being proposed to be removed, it was determined that this much removal would leave the structural integrity of the building at risks, so it needed to be evaluated and modeled by an engineer. We hired the Landlord’s structural engineer to model the building’s structure and design for new steel in order to ensure stability. We had to determine the locations for the openings at the beginning of the project, despite many factors at play. In order to provide the necessary dimensions and locations for the openings, we had to coordinate with the escalator and elevator vendors for the requirements of the equipment and get the new steel sizes from the structural engineer to support the vertical transportation. When installing an escalator, there is only an allowance of a ¼” tolerance to make adjustments in the field. Due to many inconsistencies in the existing concrete slab, the floor to floor heights varied greatly throughout the space. We hired a consultant to scan each floor in order to obtain the exact height at the bottom and top of escalators. We also developed and designed the wall partitions, which occurred at the new floor openings. Once all of the various moving parts and pieces were developed and designed, we provided the Landlord with accurate information to bid out. 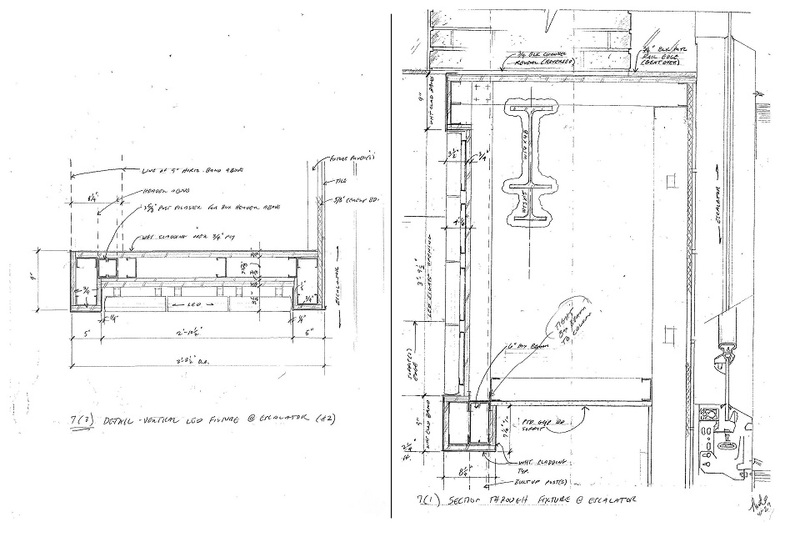 Upon completion of the Landlord’s work, we verified the floor openings with the drawings, which were a match. Results: This massive two-floor space in Times Square, spanning more than 17,000 square feet, has become a destination in New York City and has been met with rave reviews from critics and customers from all over the world. 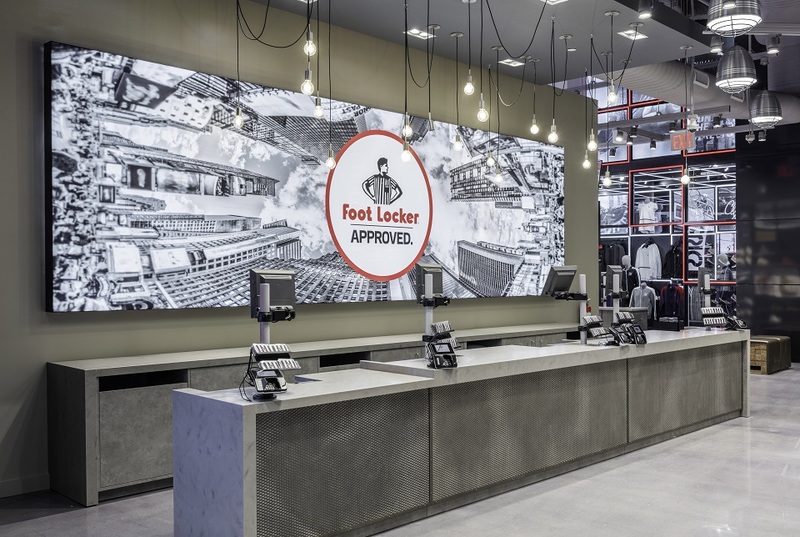 Aside from the 8,700 square feet dedicated solely to Foot Locker, the Broadway store boasts several shop-in-shops including the basketball-themed House of Hoops, Puma Lab, Adidas The Foundation, Timberland Legends Club, Converse Prime and New Balance’s NB Unite. 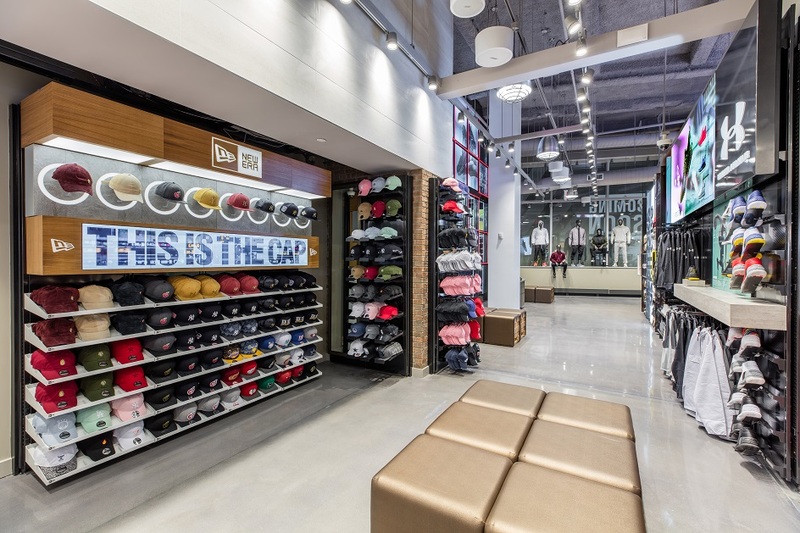 Also featured in the space are Kids Foot Locker (with a Fly Zone shop-in-shop) and the company’s new women’s-focused retail initiative, Six:02 (with a special The Collection at Six:02 section).